A quick follow-up to my previous post, which concerns the markers that one can take as proof that he or she has progressed away from childhood. 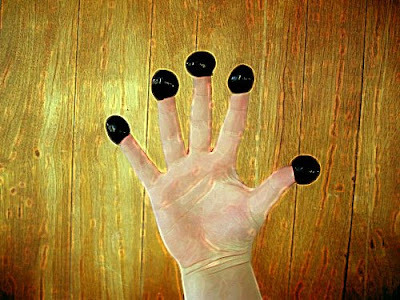 I thought of another one: the day I realized my fingers had grown too large to fit inside cocktail olives. Words can’t express how difficult this realization was for me. The good news for you and your youth is that it's usually a green olive that's a cocktail olive--the black olive, as pictured, goes in a relatively rare Buckeye Martini. You're not from Ohio, are you? Perhaps I mean normal, black olives then. Either way, my adult sausage fingers don't fit anymore.